Organizer Marnie Kunz's motivation? "I love art and running! 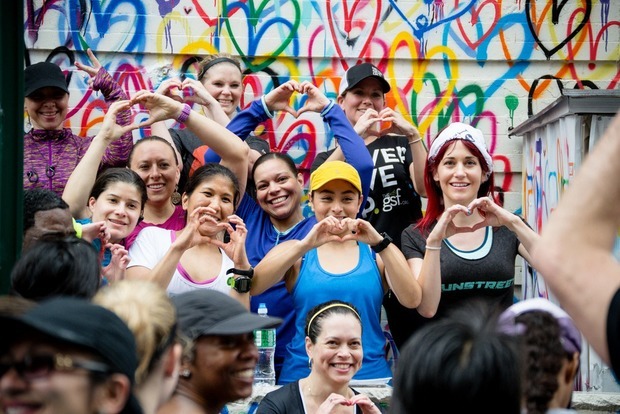 Bushwick runners, lace up: Marnie Kunz of Runstreet makes it her job to curate art running tours within NYC, and come July 31st, she'll be kicking off the first Runstreet Bushwick Art Run. Touring Bushwick Collective’s transcendent, ethereal murals, the 4-mile run kicks off at Bhati Creative Space (1099 Flushing Avenue) and goes from 10 a.m. to 11:15 a.m. Competition is not the point here: the pace target of 10 to 11 minutes per mile allows for stops along the way, and the organizers encourage stopping for photos (i.e. fun). Tickets are $20 a pop and Brooklyn-based probiotic drink company KeVita will be serving runners fresh kombucha drinks as a refreshing bonus. An RRCA-certified running coach, Kunz also holds a background in creative writing. Her passion for running met her long held interest in creative endeavors with Runstreet. “Scouting the street art for runs, researching artists, even going to street art shows and meeting the artists, I have come to love the art just as much as the running aspect,” says Marnie. In spirit of creative expression, Runstreet would like participants to really hit the ground running with the art run. Runners can enter the org's photo contest by tagging @runstreet, @thebushwickcollective and the artist on IG. The most creative photog will receive some Runstreet swag as a prize: a Runstreet shirt and a free, one-on-one coaching session with Marnie. On top of that, Marques Jackson of Filles + Garcons Photography will be the photographer on hand, capturing the Bushwick Art Run essence. “I love how street art ads so much beauty and meaning to often drab, everyday structures,” says Marnie. See you on the 31st, and don’t forget your phone (to capture all your awesome art run photos)!